Let’s talk about cold brew! 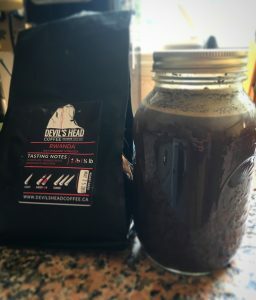 Cold brew coffee has more recently become a very popular way to drink coffee – especially on hot summer days, like what we’ve been having in the Bow Valley this summer! There are many ways to produce cold brew coffee (and yes, it IS different than simply letting your hot brew cool down, possibly with the help of a lot of ice! ), and I will review a few of the more popular methods in future posts. But today I am going to break it down for you, and go bare bones minimalist for this first post. The first thing you need to know about cold brew coffee, is that time is one of the most crucial ingredients in making some tasty cold nectar. So, as you may have gathered, no heat is applied to the brewing process whatsoever. Furthermore, you need time, and lots of it! On average, cold brew should be left to brew, or steep, for a minimum of 12 – 15hrs (more if you like your brew a bit stronger). Ideally, you would store your brewing vessel in a cool place whilst it’s doing its magic, but the countertop is fine too – you’ll just need to add ‘the cold factor’ later. One last thing to keep in mind, is that when you make cold brew, you are making a concentrate (stronger in all ways possible) – so be warned that you may need to dilute to taste, with more water, ice, or dairy product of choice. 2 large mason jars (big enough to fit approximately 3 cups of fluid in each). 3 cups of cold, filtered water. 1/3 cup (or more if you like stronger brews) of coarsely ground, freshly-roasted coffee beans – I prefer a medium roast bean, but play around with all the bean types you like, and see which one transfers the best to the cold brew method and suits your palate. Filters – I like to make use of what I have around me, so I’ll use the filter from my drip coffee maker. You can also use paper filters, like the ones used for the Chemex or other pour-over brew methods. The Method: 1) Measure out and coarsely grind approximately 1/3 cup of freshly roasted coffee beans, add to first mason jar, then add 3 cups of filtered water; 2) Apply mason jar lid and let sit for a minimum of 12 – 15 hours (more is better); 3) Transfer cold brew from first mason jar to second mason jar via filter method (I use the reusable filter from my drip machine, and, if need be, the funnel from my Aeropress, but that’s not required); 4) Apply lid to second mason jar and place in fridge to apply ‘the cold factor’; 5) Enjoy! There it is – pretty simple, right? Of course, with other methods things get a bit more complicated, but I like this method because it yields a consistently tasty brew each and every time, and it’s super simple. So there you have it – give it a try and let us know what you think! Happy cold brew drinking! !